Set up in 1993 by a group of women academics who wanted to encourage research and stimulate interest in women's history and gender history in the south west of Britain. Nanny Knows Best: The History of the British Nanny, The History Press 2013. Women on the Move: Refugees, Migration and Exile, co-edited with Fiona Reid, Cambridge Scholars Publishing, 2011. ISBN 1 4438 2568 9. 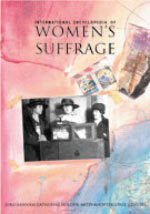 An International Encyclopaedia of Women’s Suffrage, coauthored with June Hannam and Mitzi Auchterlonie, ABC Clio, 2000. ISBN 1 57607 064 6. ‘Other People’s Children: Single Women and Residential Childcare in Mid-Twentieth Century England’ Management & Organizational History 5: 3-4, August 2010, pp 314-330.Special issue on Women and Organisational History. ‘Winners or Losers? Single Women in History 1000-2000’ co-authored with Amy Froide and June Hannam. Women’s History Review, 17, 3, 2008, pp 313-326. ‘Imaginary widows: spinsters, marriage and the ‘lost Generation’ in Britain after the Great War.’ Journal of Family History 30, 4, (2005), pp 134-48. ‘”Nature takes no notice of Morality”: singleness, and Married Love in interwar Britain’, Women’s History Review, 11, 3, 2002, pp. 481-503. ‘Heartland and Periphery: local, national and global perspectives on women’s history’, co-authored with June Hannam, Women’s History Review (special issue), 11, 3, 2002, pp. 341-49. ‘Pictures from the Margins of Marriage: Representations of Spinsters and Single Mothers in the mid-Victorian Novel, Interwar Hollywood Melodrama and British Film of the 1950s and 1960s’, co-authored with Janet Fink. Gender and History, 11, 2, July 1999. ‘Das Paradox de Familie in Historischen Context, co-authored with Leonore Davidoff, Megan Doolittle and Janet Fink. Historische, Anthroplogie’, December 2000. ‘Nanny Knows Best? : Tensions in Nanny Employment in early and Mid Twentieth Century British Chaildcare Magazines’ in eds. Rachel Ritchie, Sue Hawkins, Nicola Phillips, S. Jay Kleinber, Women in Magazines: Research, Representation, Production and Consumption, London Routledge 2016. ‘Paradoxes of Gender and Marital Status in mid-20th century British Welfare: Single Women, Unmarried Mothers and the Responsibilities of State and Family’, co-authored with Janet Fink, in Janet Fink and Åsa Lundqvist (eds. )Changing Relations of Welfare: Family, Gender and Migration in Britain and Scandinavia, Ashgate, 2010. ISBN 9 780754 678939. ‘Personal Costs and Personal Pleasures: Care and the Unmarried Woman in Interwar England’ in Janet Fink (ed) Care: Personal Lives and Social Policy, Policy Press, 2004, ISBN 1861345194. Editor and introduction, Major Themes in Women’s History from the Enlightenment to the Second World War, C.D. Rom, TLTP History Courseware Consortium, University of Glasgow 1999. ‘Becoming a Worker: Proletarianisation in early Industrial England’ co-authored with Mary Corcoran in ‘The Social Aspects of Industrialisation’, Core Resources for Historians C.D Rom, TLTP History Courseware Consortium, University of Glasgow, 1998. ‘Winners or Losers: Single Women in History, 1000-2000’, jointly edited with Amy Froide and June Hannam, Women’s History Review 17, 3, 2008 (special issue). ‘Heartland and Periphery: local, national and global perspectives on women’s history’, jointly edited with June Hannam, Women’s History Review 11, 3, 2002 (special issue). 2010-11 British Academy small grant of £7,400 for research expenses for a history of nannies in 20th Century Britain. 2006 Grants from the Women’s History Network, the British Academy and the Economic History Society for speakers and delegates to attend the conference ‘Single Women in History, June 23/24’ totalling £1,443. 2006 AHRC Research Leave award £14,013 to complete book on singleness in 20th century Britain. 2004 Visiting Research Fellowship, Rutgers University $2000 honorarium. 2002-2003 Paid consultancy at the Open University, Social Policy Department for third level course ‘Personal Lives and Social Policy’. 2001-2002 £10,000 bursary to implement online teaching in the School of Humanities awarded by the UWE Network Learning Support Framework. 1999-2000 £200 research expenses Scouloudi Award for Research. 1998-2000 £22,000 to develop and evaluate the introduction of new technology in teaching history at UWE, awarded by Courseware in History Implementation Consortium (CHIC). 1996-7 Harold Hyam Wingate Foundation Scholarship: £8,000 to research the history of single women. I was convenor of the steering committee of the National Women’s History Network, 2006-2010 and a judge of the Claire Evans Prize. I was on the organising committee for the national WHN Conference in September 2012. Since 1999 I have appeared five times on BBC Radio Four Woman’s Hour discussing different aspects of spinsterhood and female singleness. The latest item can be accessed through the link here. £10 full and £5 unwaged/student. You can download a leaflet and membership form (pdf file) here.